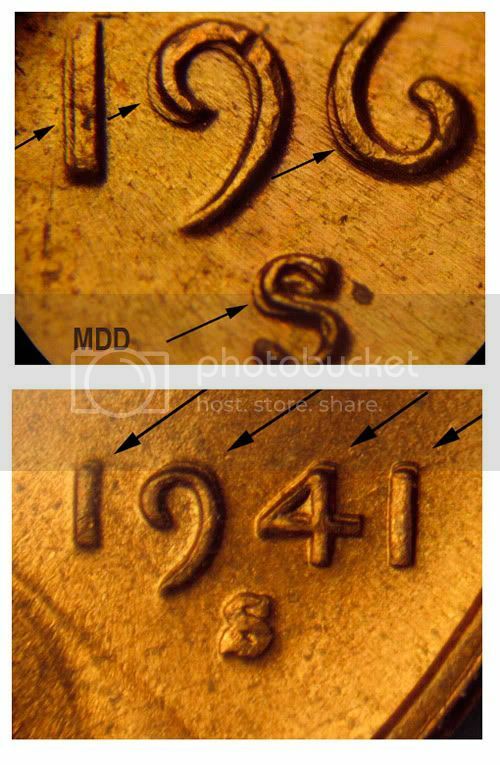 Below is a close-up illustration of Machine Doubling (MD) found on the reverse of a 1983P Lincoln cent (top) and then a close-up of doubling found on the Doubled Die Reverse listed as DDR-001 (1-R-IV) (bottom). Notice the flattened out manifestation of the MD; the irregular appearance; and change in physical characteristics of the doubled area. Compare to the rounded and raised true doubling of the Doubled Die (bottom). Machine Doubling has been designated with two types: Push Type and Slide Type (showcased in a new post down below). MD Push Doubling is extremely common and has hypothetically been suggested as a product of a loose hammer or anvil die, after the strike with some of the original energy of the strike transferred, there is a rebound and a shift that sends the die back down, typically in a slightly altered position where it subsequently hits the design on the coin and pushes it down. The result is a flat, shelf like area of the design that appears to differing degrees as being doubled. This is a reductive process that is opposite of Die Variety Doubling and some forms of Error Doubling in that part of the design is altered or lost whereas Variety Doubling the doubling adds to the size of the device in question. MD can impact as little as one letter or whole parts of the coin. It can be random or mimic classes of Doubled Dies in appearance. If the mintmark is doubled similarly to the date, odds are very high it is MD. One must remember mintmarks were added to the die AFTER they were impressed with a HUB. What that means is the die is doubled BEFORE the mintmark was punched into the die. This is true for all denominations of coins until 1989 as the Mint stopped punching mintmarks in 1990. The illustration below shows a 1989 Lincoln that has MD on the date, the ear, the Y in LIBERTY and part of the coat. You can see the push down was only partial and at first glance almost looks like doubling. The area in blue (MD2) on the date represents the compressed area and along with the preceding graphic (MD3) shows how the doubled areas, if removed, cut down the size of the device and make it irregular. The illustration of 1989P 1DO-005, a Class VI Doubled Die with extra thickness in the date, and 1972P DDO-00, a very strong Class I, offers a contrast to the MD in that the doubling adds to the normal size of existing devices and remains rounded. (MD4) is a close up of the flattened area of the 8 that also shows metal flow lines from the MD impact. At the bottom, 1909P DDO-001 shows class IV doubling RTY in the form of separated images. While not as rounded as some examples, the serifs technically are notched and there is no loss in size of the primary device as in the example (MD5) with MD on the Y (to the left). Machine Doubling is sometimes called by a seller or a buyer as: strike doubling, machine doubling damage, sheer type doubling, mechanical doubling, ejection doubling, field doubling, shelf doubling, double date, and erroneously as a Double Strike or a Doubled Die. there is currently no place where doubling and its many forms are more confused, through ignorance and deception than eBay. The abundance of readily available information that accurately explains Varieties and Errors is seemingly outmatched by the ignorant, misguided buyers and equally ignorant or dishonest sellers who peddle garbage. The auction titles and descriptions often contain inaccuracies or made up terms such as: double dies, double dyes, double dates, double die date, DDO strike variety, mechanical DDO type, doubled date obverse, etc. Most often sellers are only able to describe what they see as “doubling” and generally know very little if anything about types of doubling or classes of Doubled Dies. Another range of auctions try and take the ’55 poorman’s double die (PMDD), a misnomer, and further apply that term to coins with MD on the ‘69S or ‘72P. In other instances the seller offers a coin as a possible Doubled Die or double die with a question mark (??) at the end of the auction title. In cases like this the sellers will offer vague descriptions, sometimes poor photos of coins with MD or DDD and make the promise of the buyer either getting potential high value coin for very little or some sort of glory as the discoverer if, you the buyer, submit the coin for authentication later. All hogwash designed to deceive buyers into buying a worthless coin. Below are more views of MD. Here we have three different 1983 Lincolns that all exhibit varying degrees of MD and all could easily be sold on eBay as DDRs. They are contrasted by two 1983 DDRs: DDR-001 and DDR-002. 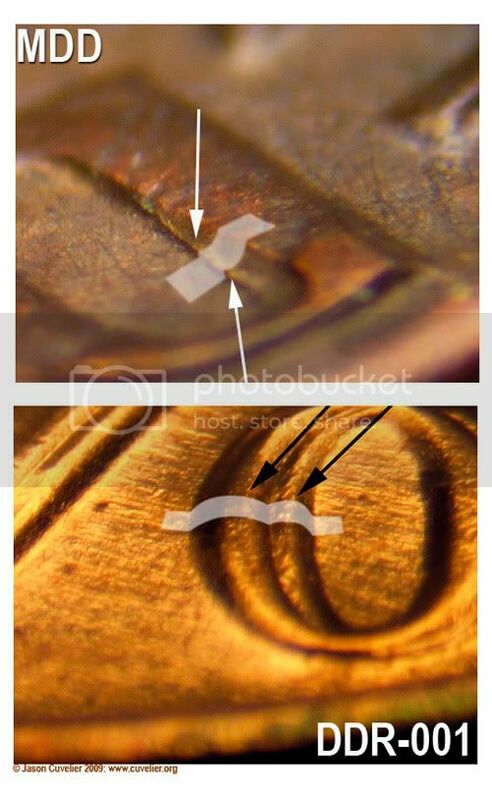 The Double Dies are rounded with distinct secondary images while all the examples of MD show compressed metal and the reduction in size of the effected device. The memorial, the O in ONE and parts of UNITED are very frequently doubled by MD on any and every year of Lincoln cent. DDRs very rarely show doubling on the memorial itself, and it is always rounded. There is nothing as classic as the classic Machine Doubling found on 1969S Lincoln cents. Many collectors have thought they hit the coin-lotto by finding a very common machine doubled BU cent while roll searching. The key typically is that the mintmark ‘S’ also has MD. Below the ’69S is a another classic example of flattened, shelf-like MD on a 1941S Lincoln. This final set of illustrations shows typical MD found on the reverse of many Lincoln cents. Flattened areas with no notches and a reduction in the size of the devices. 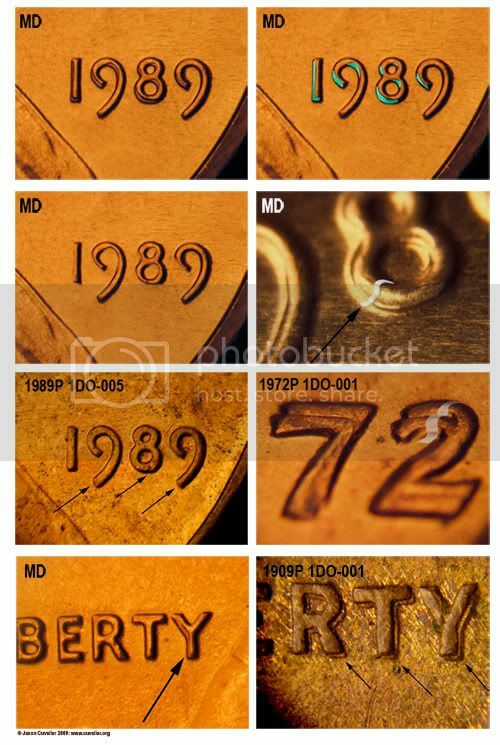 Compare the “of” with MD to that found on 2004P DDR-001 or 1964P DDR-001 which has notches, clear separation lines, rounded doubling and extra thickness. Below that is a case of isolated MD on Lincoln’s chin, compared to doubling found on 1971S DDO-002. Doubled Dies with doubling of Lincoln’s profile are very rare while profile doubling from MD is rather common.